Award winning speaker and OSU Expert Jack Park will be the featured speaker at this years’s Buckeye Bash & Scholarship Auction hosted by The OSU Alumni Club of VanWert/Paulding Counties. Jack has written 3 books: The Ohio State Football Vault; The Official Ohio State Encyclopedia; and Ohio State Football….The Great Tradition. The Buckeye Bash & Scholarship Auction will be held at Willow Bend Country Club; 579 Hospital Drive; Van Wert, Ohio; on Tuesday, November 7th, 2017. Tickets are $20.00 each and include your dinner. Doors will open at 5:30 P.M. Dinner will be at 6:00 P.M. followed by the Scholarship Auction and the Guest Speaker, Jack Park. Jack has a new book coming out on November 15th in which he features Bryan Fogel from Columbus. 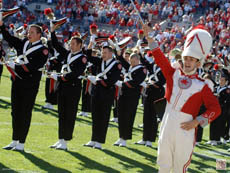 He is well known for his huge Buckeye Room which was recently featured on ESPN’s Game Day. Brian will be bringing several items for display from his famed collection along with a few of his OSU player figures he makes to sell. The Buckeye Bash is open to ALL OSU Fans! To all fans attending, please consider bringing a non- perishable food item donation to be divided between the Van Wert & Paulding Food Banks. Those bringing food items will be placed in a drawing to win an OSU shirt. All proceeds from The Buckeye Bash and Scholarship Auction will go to benefit OSU students from Van Wert & Paulding Counties. The Scholarship Auction for this year will include tickets to the OSU vs Michigan State football game in Columbus on November 11th.